COMING SOON, NATURE’S BEST ORGANIC HOG & SOW PELLETS ARE FREE OF BONE MEAL AND ANY OTHER PRODUCTS YOU WOULDN’T WANT YOUR CURLY-TAILED FRIENDS TO INGEST. KEEP AN EYE ON NATURE’S BEST SOCIAL MEDIA FOR ANNOUNCEMENTS ABOUT ITS AVAILABILITY! 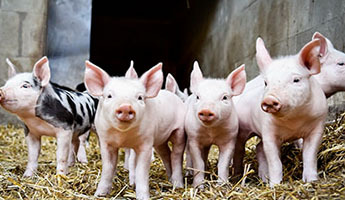 From birth to maturity, Nature's Best Organic Hog & Sow pellets result in easy feeding and less product needed to cause weight gain. The pellets, which are free of bone meal and ruminant products, travel easily through feeders and produce minimal dust. Kreamer Feed, Inc., one of the nation’s leading providers of premium animal feeds, is proud that its Nature’s Best Organic Feeds line is Non-GMO Project Verified. The Non-GMO Project is North America’s only independent verification for products made according to best practices for GMO avoidance. Non-GMO Project Verified is a meaningful and achievable way for suppliers, brands, and retailers to show their commitment to providing consumers with transparent choices in the marketplace. 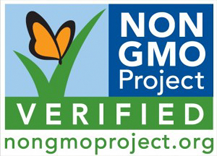 Many brands place the words "Non-GMO" on their packaging, but only brands with the butterfly emblem displayed have taken the steps to become officially certified by the project.